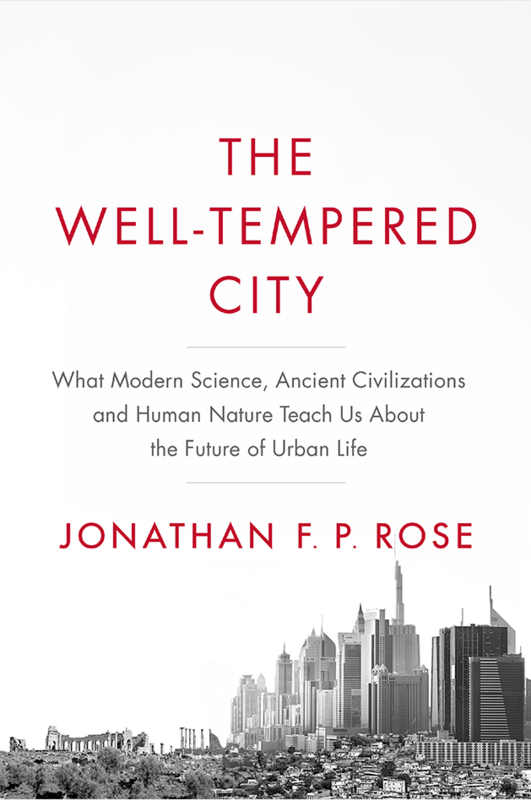 The Well-Tempered City: What Modern Science, Ancient Civilizations and Human Nature Teach Us About the Future of Urban Life, by Jonathan F.P. Rose, Harper Wave, September 2016, 480 pages, $18.74. The Well-Tempered City, is a deeply felt and wide-ranging book by Jonathan F. P. Rose, planner, developer and long time New Urbanist. Its subtitle, What Modern Science, Ancient Civilizations, and Human Nature Teach Us About the Future of Urban Life, offers a hint of the book’s depth and complexity. It is a book mindful of history; hopeful in its outlook; and helpful with the examples it gives. To tackle those challenges, Rose identifies five essential qualities that make “happier and healthier cities:” coherence, circularity, resilience, community and compassion. He draws on information from multiple disciplines to define, articulate, and draw lessons for each quality. One wishes that he had written more about his experience on how to actually build high-quality, green and affordable housing and about Via Verde, a building in the Bronx, that in many ways embodies in a single structure the values set forth by this book. But that is, perhaps, another book. This entry was posted in Books, New Urbanism, News. Bookmark the permalink.